At first, your newborn’s sight is fuzzy and abstract. Learn how your baby learns to see — and bring her life into focus. When uncle Fred makes funny faces at your newborn from across the room, the only person he’s entertaining is himself. That’s because at first, a baby’s eyes aren’t quite ready to handle all the colors, shapes, and 3-d objects of her brand-new world. “people think that babies see well at birth, but they don’t,” says Stanley A. Appelbaum, OD, an optometrist in Bethesda and Annapolis, Maryland. All of your child’s other senses — touch, taste, smell, and hearing — are ready to go at almost full power at birth. But vision takes some time to develop. For instance, months will pass by before your baby can see in color. For now, she sees in only black, white, and gray. And eye movements are pretty uncoordinated at the beginning, which means a newborn’s eyes might move independently of each other. As your baby grows, her eyes will get stronger. Read on to find out when and what she sees, plus how to keep those baby blues healthy. So just what does your baby see at birth? Experts estimate that a newborn’s vision is about 20/100, meaning he can see that teddy bear if it’s within 8 to 12 inches but not if it’s off in the distance. “a baby’s vision is somewhat blurry, but not in the sense of looking through wax paper,” says Michael X. Repka, MD, a professor of ophthalmology and pediatrics at Johns Hopkins University, in Baltimore. “he can’t see fine detail; it’s more impressionistic. It’s like the difference between a photograph and a Monet painting.” Your baby is also particularly interested in human faces, which means he’ll be excited to get a good look at you during feeding time and when you sneak up on him in the crib. Also, we gravitate toward choosing pastels for babies, but it’s easier for them to pick up on primary, contrasting colors at the beginning. Surround your baby with these — decorate his room and dress him in them. As a baby learns more about his world, his brain begins to form connections that let him process what he sees. Specifically, development in the nerve cells helps the eyes communicate with the brain; the speed of transmission between the eyes and brain increases over time. But when does your baby start seeing the world like you do? Eight months is a good benchmark: at this point, he should be able to judge distance somewhat accurately and distinguish among softer colors like pastels. It’ll be years till your child can tell you how or what she’s seeing, which is why you should look out for potential problems. Be particularly watchful after 3 months, when you can get a good gauge of your baby’s development. If you see any of these signs, talk with your pediatrician, who may refer you to a pediatric ophthalmologist. Baby doesn’t look you in the eyes. She doesn’t lock onto targets such as faces or toys. She doesn’t blink when lights go on. Her eyes turn inward or outward. Even if your child doesn’t show any red flags, your doctor should check out her eyes at every well visit. This is important because 1 in 10 kids is at risk for undiagnosed eye and vision problems. And if you have a family history of eye problems, consider regular preventive eye care. If your child is between 6 and 12 months, you can schedule a free vision assessment through Infantsee (infantsee.org). If you have specific concerns, an eye specialist can pick up on problems that a pediatrician isn’t trained to catch, such as cataracts. He’s also probably better equipped to deal with kids, which can speed things along. Rebecca Sullivan’s 3-year-old failed his eye test with the pediatrician — he didn’t know all of his letters and some of the pictures confused him. But at the eye doctor’s, Joseph had no problems because the pediatric ophthalmologist had kid-friendly eye charts that contained pictures of objects like suns and boats. Blocked tear duct common within the first few months, this happens because the duct is small at birth and normal secretions can clog it. To treat it, you can “milk” the tear duct by gently rubbing it outward (it’s located under the eye, on the inside corner). This should force the goop out and unblock the duct. If you see green goo, the area is infected, and your doctor can prescribe a topical antibiotic. Nearsightedness and farsightedness this means your baby has a hard time seeing either up close or far away and will need glasses. Some signs: he’s having a hard time focusing on objects that are either near or distant. Rubbing eyes can also signal vision impairment. In an exam, the doctor will check your baby’s pupils, see how they react to changes in the level of light, and ask your child to follow a light with his eyes. If your doc senses a problem, he may refer you to a pediatric ophthalmologist, who can do some tests using an instrument called a retinoscope; this determines the degree of vision troubles, if any. Mild vision problems typically aren’t detected until age 3. 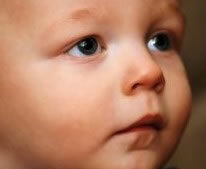 Misaligned eyes in some kids, eyes can cross inward or outward because of weak eye muscles or developmental problems. Surgery on the muscles surrounding the eyes can sometimes help realign eyes. But often, doctors like to try therapy first, such as vision therapy or therapeutic lenses, to see if vision can improve without surgery. Pinkeye a red, itchy, goopy eye may signal conjunctivitis, an infection. If your doc determines that the infection is bacterial, she’ll prescribe antibiotic eye drops. If the infection is viral (indicated by a runny nose and a cold), baby should get better on his own within ten days. Both kinds of infection are contagious, so wash up after touching baby’s eyes or hands. Place her crib in the room’s center or as far away from the wall as possible. Kids benefit from an unobstructed 360-degree view. Speak to baby from both up close and far away. This forces her to look around, helping her to develop vision and a sense of place. Hide things. Once baby is a few months old, partially cover her toys with a blanket. This helps her navigate the world in 3-D.
Make a mess. Crawling under and around obstacles helps vision. For toddlers, make a gym of pillows, furniture, and toys. Birth: A newborn can see 8 to 12 inches in front of her. At first, she’ll have to move her whole head in order to move her eyes. 1 month: Your baby can better fixate on and track objects within 12 to 15 inches. She can determine contrast and see images in black, white, and gray. 2 to 4 months: Baby’s eyes can move independently. Also, she should be able to lock onto faraway targets — she can probably see you at the opposite end of the room. 3 months: A child is seeing more colors, shapes, and textures. Her eyesight is more similar to what we experience as adults. v4 months: More depth perception develops, allowing your baby to see in 3-D.
v8 months to 1 year: Ta-da! Baby’s vision is almost adultlike — she can see people and objects from a greater distance. Originally published in the January 2010 issue of American Baby magazine. Share the post "Baby Vision: What Your Little One Sees"
Previous PostWhen Should Infants Have Their First Vision Examination?Next PostHow Well Does Your Baby See?